Fresh off a hard fought game against Tennessee, the Georgia Tech Yellow Jackets will host the Eastern Carolina Pirates on Friday night. The game will be broadcast on ACCNE at 7:30pm. So who is Eastern Carolina? Well aside from being the largest school in North Carolina and being known as the NC "party school", they are currently making their way into the conversation as the up and coming program in the American Athletic Conference. The ECU program made a fantastic hire during the offseason, luring Florida Gulf Coast coach Joe Dooley away from Fort Myers. Dooley spent time in the Bill Self coaching tree prior to his hiring at FGCU. He was widely known to be one of the Jayhawk's most effective recruiters early in the Self era, credited with landing players such as Cole Aldrich, Tyshawn Taylor and Mario Chalmers. 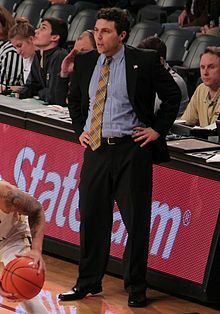 In 2013 he left Lawrence for Fort Myers for his second head coaching position, replacing Andy Enfield after he departed for USC. In five seasons at FGCU he made the NCAA tournament twice and the NIT twice. He won 21 games or more in all five seasons and never finished worse than second in the Atlantic Sun Conference. He departed the Eagles with a 114-58 record. The interesting thing about Dooley is that he was actually the Head Coach of the Pirates before this season. He led the purple and black from 1995-1999 after Eddie Payne departed for Oregon State. During his first stint at ECU, Dooley went 57-52. The Pirates come into the GT game with a 2-1 record, averaging 79 points per game. ECU also played Lamar early in the 2018-19 season, a game in which they needed overtime to win. ECU has an ACC flavor as Dooley brought on former Virginia Tech Assistant Coach Steve Roccaforte, who in turn brought former Hokie Seth LeDay with him. He's also bringing former Hokies Tyrie Jackson and Khadim Sy in for the 2019 class. LeDay has led the Pirates through the first three games, averaging 16.3 points and 6.3 rebounds per game. Freshman Jayden Gardner and sophomore K.J. Davis give Dooley a nice duo to back up LeDay, combining to score 25 points and snag better than 12 rebounds per contest early in the 2018-19 season. The straw that stirs the drink is senior point guard Isaac Fleming. The former Hawaii Rainbow Warrior has been a fantastic addition to the Pirate program, averaging 12.2 points, 4.8 assists and 1.4 steals per game through 33 games. Fleming is solid but does not provide an outside threat, shooting less than 28% from deep over the course of his career. Strangely enough, one of Georgia's own is the player that concerns me. Freshman Tae Hardy, a Miller Grove product, has played well early for the Pirates. The 6'3" guard averages 9 points, 2.7 rebounds, an assist and a steal per game early in his career. He likes to jump passing lanes and get out in the open court. He could be a huge X-factor in this game. At the end of the day it's hard to predict what we will see here. This is a new coach with a new program who has yet to stock the pond with his players. Dooley keeps the tempo pretty low and doesn't historically play a ton of defense (according to KenPom). Given the most recent performance by the Jackets against Tennessee, I can't imagine the spread is going to be crazy. I do like the Jackets to cover in this contest if the spread is set at single digits. East Carolina is not Tennessee. I think this is the game where Jose Alvarado and Shembarri Phillips both get right. Banks is rushing a bit. Wants to make a huge impact immediately. It’ll come, and it did later on with a nice no look from Jose for a slam. We are so guard heavy we can never put our best five in the court of Jose, Alston, Phillips CGB and Devoe. Devoe, Alvarado and CGG. Love this trio. Jose was all over the place last night and Devoe and Curt shot it really well. Love that Pastner left Moore in the game after that horse **** flagrant. AD just keeps hitting that little hook over the left shoulder. If he could get a little deeper he’d be damn near unstoppable in spurts. I really like Shembari as well. We seem to play a bit more poised when he’s on the court. Guard depth haha. The last con is also a pro. We have 5 good guards. COJacket, tbglover, D-man44 and 7 others like this. Anyway, I think this will be a good game. Whatever the outcome, Dooley’s young Pirates will be well prepared and ready to play this one against Georgia Tech College and the gold and black. GTRX7, GT14, MidtownJacket and 5 others like this. I think PirateCakeLady was talking about how you referred to East Carolina as Eastern Carolina and said the colors are purple and black as opposed to purple and gold. Yes, Pirate Nation is a very passionate fan base. The university has been around for well over 100 years. It’s difficult to understand how others may refer to it as Eastern Carolina. Overall, your review was fairly accurate about the team. It looks like you did your homework for the most part. There’s a little bit missing there though. SoCal_GT_Fan, PirateCakeLady, GTNavyNuke and 5 others like this. Sir, as an East Carolina University Pirate, I respectfully request that you check your facts about my university. My niece is a former Ga Tech athlete from North Carolina and I am certain that she will be disappointed with this reporting. I always pull for Ga Tech, except of course when they play my Pirates. My blood runs Purple and Gold but, I do support the Yellow Jackets also. My wish is for a good, hard fought game from both teams on Friday. LongforDodd, awbuzz, AUFC and 4 others like this. Best athlete on the team: Khalid Moore. He jumps off the screen compared to everyone else. He is ACC ready athletically. If we can harness it this year by getting him up to speed defensively, even if the trade-off is limitations offense, I won't mind seeing him get a lot of minutes this year at the 3 or even the 4, depending on opponent. I really like his upside more than anticipated after seeing the first few games. ASURAMS07, lauraee, ChasonBaller and 2 others like this. - CJP is right - this team can be a very good defensive team. I don't think as good as two years ago, but much better than average. - Cole did not dress, boot on foot - not sure if serious or not. ----- AD and Banks played some together (and some together with Wright also out there). AD has improved on the perimeter, but I don't expect to see him out there much as it does limit the offense. Definitely better than what I saw vs. Lamar. Hard pressed to think we don't win next two at home by double digits. Hard to judge it vs. Tennessee as ECU does not have the size/players UT does. UT defense knocked us on our heels - and we stood around a lot. I do think we played good D vs. UT and again tonight. GTHomer, THWG, SecretAgentBuzz and 2 others like this. Thank you. Yes, I was referring to the incorrect name of my university. We fought long and hard to retain/obtain the name East Carolina University. If the UNC school system had its way every state school in NC would be [email protected], but of course they would be the only one that could be called "Carolina". I hope this is a good hard fought game between these two teams. Great fun getting to share it with my niece in Houston. GTNavyNuke, lauraee, awbuzz and 2 others like this. I was desperately trying not to mention Hewitt as his stated goal was pretty similar to what I described. But I agree with you he put way too much pressure/importance on the PG to initiate the offense by beating his guy off the dribble. That is why his offense generally sucked. I also agree with you that Devoe is likely the bell cow for this year's offense. He certainly comes with the pedigree to be an ACC scorer. I haven't seen a ton last year or this but he doesn't strike me as a Reddick type catch and shoot guy you have to engineer shots for but rather a shooter who can slash when given a slightly assisted chance. So this leads me to why I think Tennessee is an important data point. Not that I thought we would win - and in fact I am happy we played the tough level of D we did. We did good from my perspective. But what it showed me was we don't have players - Devoe in particular who are skilled and strong enough yet to break down above average defenders. They need help. How Pastner gets them help to generate shot opportunities or driving lanes is my question. I keep talking about Michigan or other what I consider high end perimeter based offenses that we should emulate. They are not incredibly structured offenses but they do have rules that teams follow for picks and movement that really work. I didn't see the ECU game - only radio - but I didn't see the type of movement and rules that I would hope for against Tennessee in particular (or Lamar). They are not difficult but we need to start putting them in before we play VT, Clemson or especially a UVA. My early impression of Devoe was, "whoa, he wants the ball in his hands, he wants to create off the dribble." He has more Kenny Anderson in him than Mark Price (as archetypal comparisons). I haven't seen him much yet so maybe I am mistaken. Tennessee just stuffed us on the perimeter. They were too big and too experienced and we are not functioning at a high enough level in what we are trying to do to compete with that when we played them. We lost confidence and couldn't even make our open shots. Teams are always a work in progress as the season progresses. Not all teams come together, but I think that our team has a greater capacity to improve than most because of our youth and newness of scheme (not to mention our defensive up-side). I am of the bias (for college) that cohesive execution of team concepts is at least as important as individual talent (which is why we see so many really good mid-major teams). This is also why one can predict who is going to be good by just looking at who the coach is. So for me, it is not so much about who we got, but how they play together. Not saying I'm right, but that is my bias. BTW, this is a fun thread, especially for a post ECU game thread. Thanks to all who made it that way. Sean, AE 87, New Old Guy and 1 other person like this. From watching all three games thus far, as well as the exhibition, I believe this last game is one where I am seeing a glimpse of what Pastner has envisioned for his offense. In the first two years, we have been pretty structured, with predictable sets, running the offense through Lammers in the high post and prioritizing minimizing turnovers. The first couple of games have been similar, save not running the sets through the high post. But there have been some moments of play where the offense doesn't seem to be running sets, where there are more dribble drives and extemporizing. At first, I thought it was just sloppy play because there were more turnovers. But, there was also more second chance points because the defense was scrambled. There were more of these moments in the ECU game and it occurs to me that this is actually what we are going for. I thought that Devoe had been wild in his creativity, but it started to work against ECU. The fluid players like Wright, Moore, Devoe, Gueye, etc who tend to look sloppy in the context of structured sets may actually be the guys who lead the transition to a more "loosey-goosey" style of offense. I'll be interested to see if my impressions are whacked or if we actually see this. This still looks like a defense-first squad. They could be special by the end of the year, especially with the addition of the "Bull in a China Shop" Banks. We needed help on the boards and I think he will do that. He also won't be muscled in the paint like Gueye, Wright or Cole. Banks may be a liability on the offensive end. In his first two games, his hands were terrible. "Manos de pierdas." Phillips has been solid on the dfensive end. He is strong. And while he has shown glimpses on assertiveness on the offensive end, our O tends to stagnate when he is in there. He has to put in a more consistent effort to pressure the defense. Otherwise he represents a bit of a conundrum, being a key defensive performer, but bogs the O a bit. Alavarado has not started the season on fire but I love this guy. Reminds me of Chris Corchiani, even if I date myself with the comparison. Devoe gave us our first sneak peek of what to expect of him in the ECU game. Fluid player who wants to create on the move. Alston has been a bulldog, being consistently assertive despite the fact that he doesn't have the best tools. He is showing a Senior's attitude, which we need. Gueye has fine post moves. I was frustrated that he got himself 4 great looks against TN and missed them all. I think he will be valuable against the ACC quality teams because he will command double teams. But he can be muscled and can be needled to lose his cool. Ogbonda looks like he has finally developed to the point where the speed of the game is not overwhelming him. He might be able to help us. The next ten games should tell the tale. Cole has had a terrible start to the season. He had been woefully passive before he turned his ankle. Hope he turns it around. But I really like Moses Wright. He fits the free-wheeling style of play and he tries to do good things out there, even if he doesn't have the polish to accomplish everything he tries to do. That means he is a little wild right now. But if his polish catches up with is physical skills, watch out! Love me some Khalid Moore. He is way better than his recruiting rankings. He's long, athletic, has a motor, Ds-up and is far more polished on offense than I thought we was going to be. His game also seems to fit a more free-wheeling offense. I think he helps right away. I'm also a fan of Sjolund and still think he has a shot to help this year. His defense is improving rapidly but he will make his hay on the offensive end where he is fluid and creative. He can pass and get his own shot. He is a decent athlete and shows open joy when he is on the court. In the last two recruiting classes: Alvarado, Haywood, Wright, Devoe, Moore and Sjolund. that is the core of the turnaround, right there. GT has been struggling to create offense forever. These six players will be the key to changing that and showing the basketball world that we can play a funs style of basketball. GT14, DH9387, MiracleWhips and 1 other person like this. Having to watch it late because work but my thoughts are as follows. Very slow start offensively. Some decent looks that didn't fall, but I still wish Jose would take control more. Length on defense still looks to be a big plus. Also saw the potential to pile on points quickly as by scoring 22 points in a 5 minute stretch featuring several threes. I love the way this team plays defense. This may not be a NCAAT team, but I feel like we'll have a NCAAT level defense. Thought Devoe looks more comfortable and played much better. He shot is so smooth when it is on. Really seemed under control and calm. This was the Haywood we need. More assertive and obviously productive. Even early on it looked like he was looking for his a bit more. I can see why Banks was a 5*. I can also see why he didn't play much at UT. Lots to work with but also lots of work to do. For the second game in a row he tried to throw it down emphatically and had it bounce off the rim. Like the intent, but sometimes finesse is needed more than power. Jose is a sneaky little **** defensively, and I mean that in the best possible way. Gueye had a solid game but not great. I do think the threat of him scoring down low will be important. Moore has a good amount of freshmen mistakes but I like his athleticism and feel on the defensive end. Don't think Sjolund will be much of a factor this year. We actually have a good lineup for small ball this year with Jose, Devoe, Haywood, and Phillips, with Gueye at the 5 and I imagine Banks would also be a good option in that situation. Overall, through 3 games, I think we have shown pretty much what I hoped, but also what I expected. This team can make a living on the defensive end, and for once we have guys capable of hitting the outside shot. I think we'll be very inconsistent in that regard both game to game, and during games though. It should be fun watching these guys develop over the course of the year. I think there is a chance for this team to gel and make a splash this year. THWG, MikeJackets1967, H-Wade and 1 other person like this.